I know you are supposed to be paying attention when in the line-up of a showing class but I’ve previously been distracted by the lovely browbands sported by Karen Gibney’s small riding horse Aamira . When Karen admitted that she had made these herself I was one of many people urging her to make more and sell them, something that I am delighted she has done. 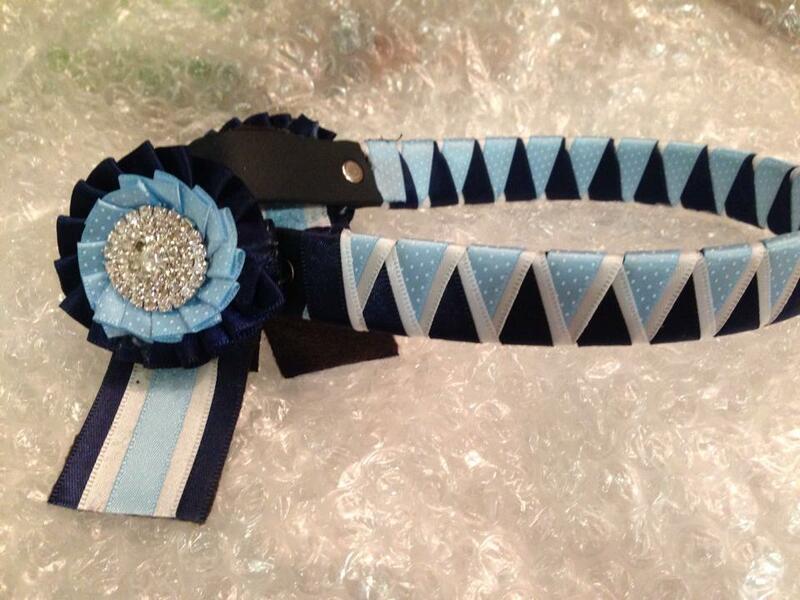 Special Edition Browbands (named after the little mare in question) is Karen’s Facebook page and details the wide range of coloured browbands on offer. 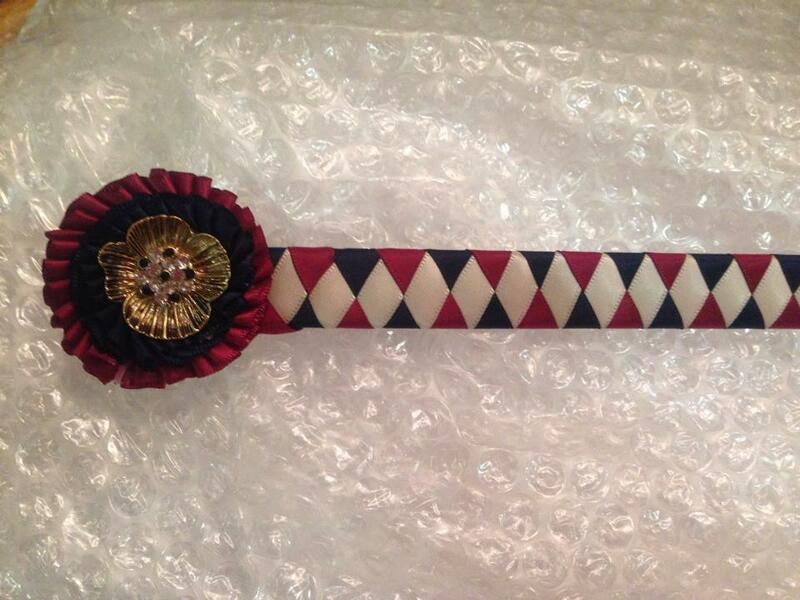 Each quality browband is custom made by hand and customers can choose their colours, design, type of rosette and level of bling required. I bought my own name plate early this year in memory of my beloved pony Siog. These name plates are approx. 4×6 inches and are hand painted to order. The level of detail in these is just exquisite and reflects Nadina’s ability to capture the essence and personality of an animal. My nameplate quite simply “is” my pony from the slight droop of one eyelid due to an old injury to the tilt of her head. 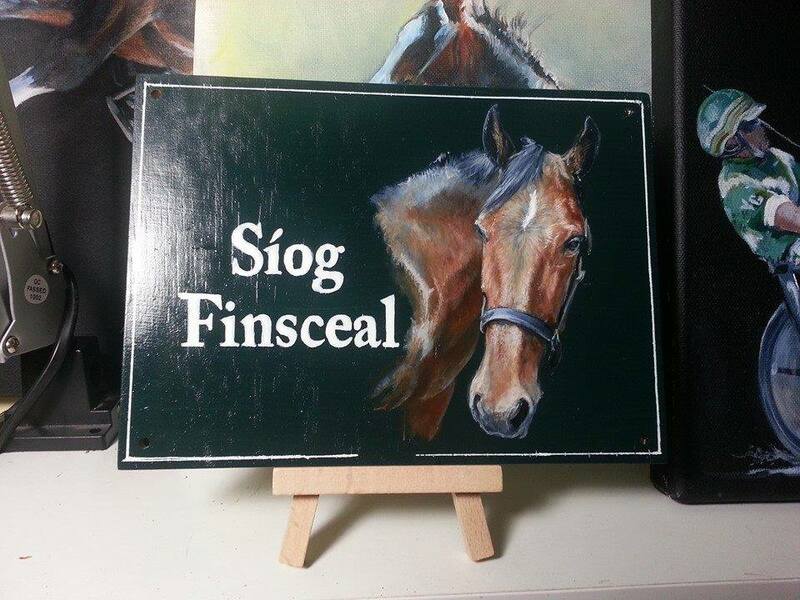 Nadina does custom paintings of all sizes to order and is also a talented photographer but the nameplates at just €50 plus postage are an amazing price for your own piece of art. I have since ordered two others as presents and they never disappoint. I’ve a lock of hair from my old pony that I am hoping to get made into a piece of jewellery. I have looked at a few providers and while all are lovely, I found that some were very pricey. I recently stumbled across Memento which is an idea by Sarah Parry who runs A Bit on The Side-saddle and supplies side saddles and accessories. Sarah’s own mare passed away recently which inspired her to offer these customer leather bracelets which are inlaid with the hair of your chosen horse. 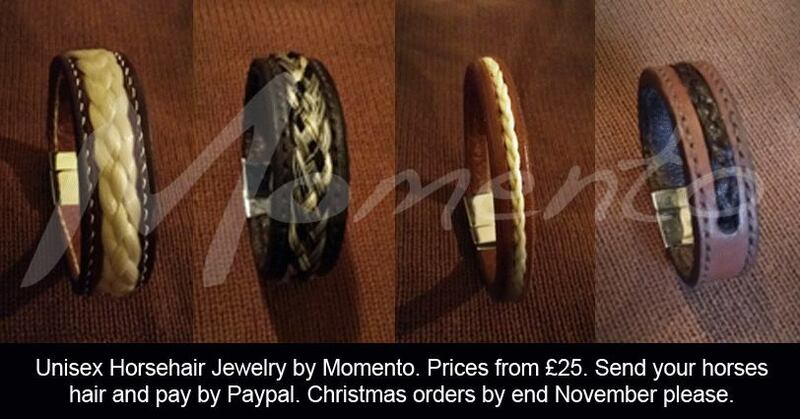 These leather wrist bands are just £25. I love the look and will definitely be ordering myself one of these in the style on the right. Self-taught Irish artist Leonie Sutton has always had talent but only started to work as an artist full time in the past few years. 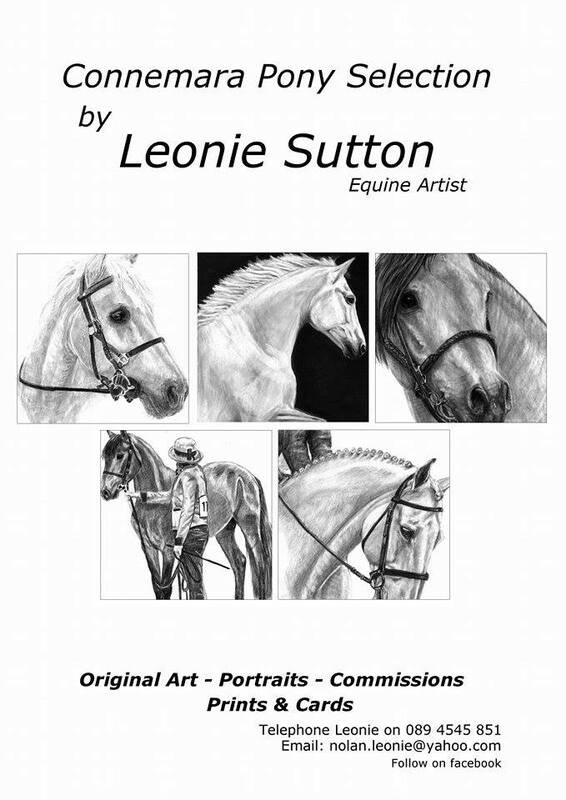 Leonie has already exhibited in the RDS and sold her work at home and abroad. 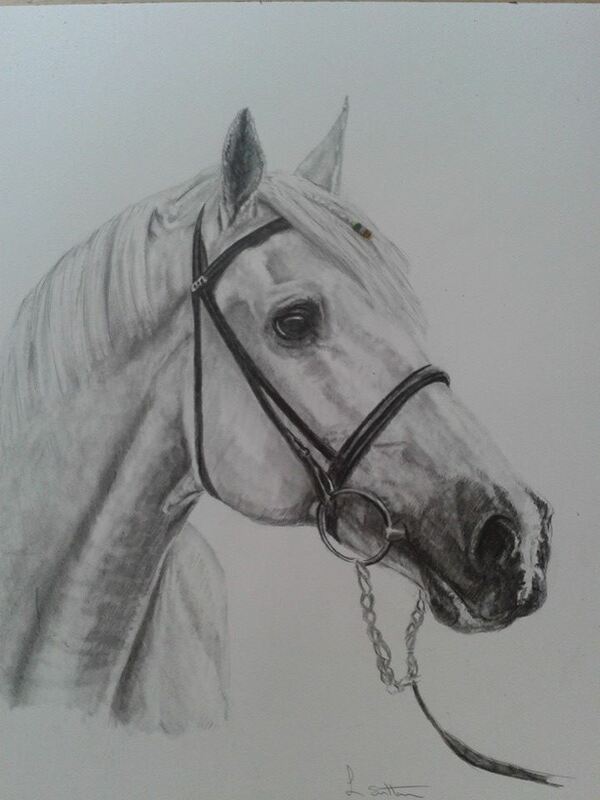 Leonie works in pencil and in paint and creates custom animal portraits from as little as €95. My favourite of her items are her packs of cards which are all illustrated in her original pencil sketch and are perfect for any occasion or even for framing. A pack of five cards costs €12 including postage to Ireland or €15 including postage abroad. I have two different packs of these which I bought at the RDS and also one card with a side saddle sketch that will not be posted to anyone as its too lovely to give away! I found Art by Suzie last year on Facebook and ordered a painted bag for a friend for Christmas. The bag arrived painted in cartoon detail based on a photograph of the dog that I had emailed. I was thrilled with it as was the dogs young owner. It was yet another example of how small our little world really is as I’ve only just recently found out that the Suzie in question is a lady I’ve photographed and ridden with side saddle! 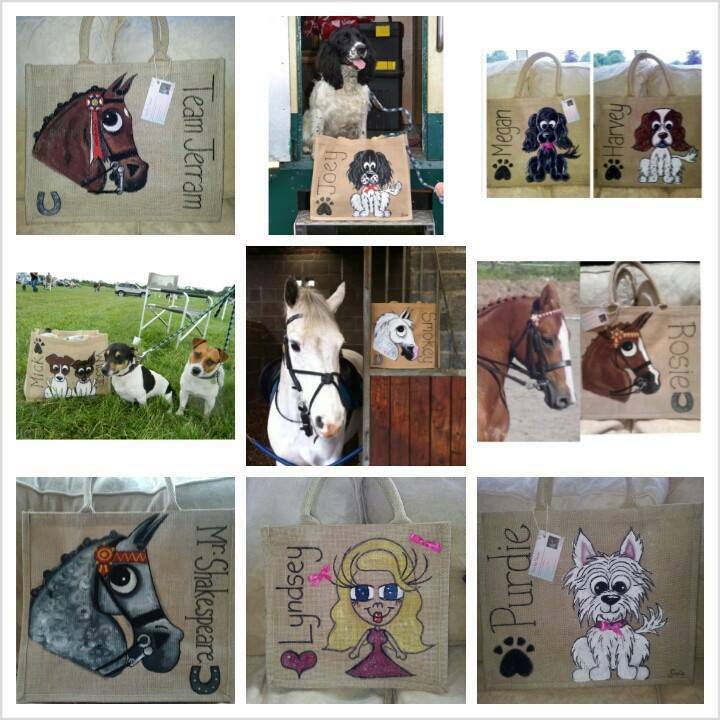 Not limited to dogs Art by Suzie also paint horses and people and can design any bag to order. These are a really fun gift for riders of any age. 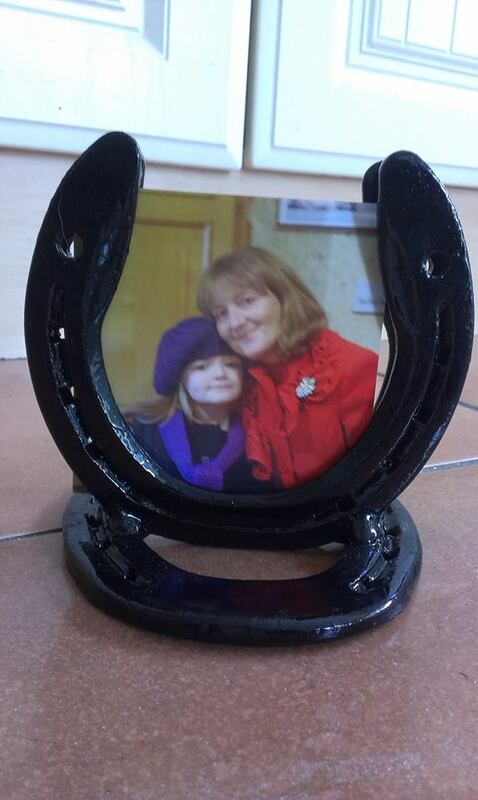 I love having horse shoes at home to bring luck and I was really taken with the range of items made by Fiona Murphy of If You Build It They Will Come. The horseshoe wreath and photo frame are a brilliant idea and a lovely way of upcycling horseshoes. The signs made using horseshoes on wood are all made to order and can be used for welcome signs at yards and homes. Fiona also makes a variety of home items from coat hooks to pot stands. For anyone with children, check out the fairy houses and the toad stools that the company also make – these are just beautiful and one of the most original ideas I’ve seen in a long time. Sometimes the simplest ideas are the best. I wanted to order something monogrammed for a friend for Christmas and was struggling as one of the colours I needed was quite specific and I just couldn’t find it in stores. I found this website thanks to Google and it was exactly what I needed. Anything from jackets to saddle cloths can be embroidered and the site has a huge variety of stock and saddle cloths to choose from with every personalisation option available from lettering and coloured piping to crystals to embroidered stars. The item I ordered has since arrived through fast delivery and its perfect – really good quality and the colours are spot on. I spoke with the company when I was ordering and found them really helpful so I would have no hesitation in recommending them to others. 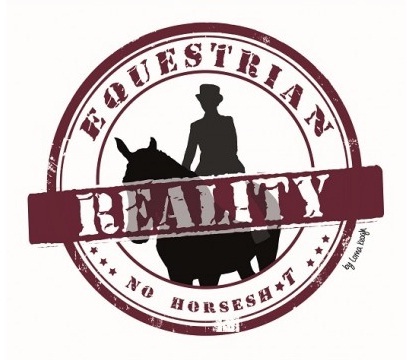 Posted on November 27, 2014, in Equestrian Art, General and tagged art by suzie, brow bands, browbands, christmas shopping, custom made brow bands, embroidered saddle cloth, equestrian cards, equestrian embroidery, equestrian shopping, hand painted bags, handmade irish gifts, horse cards, horse gifts, horse hair bracelet, horse hair jewellery, horse inspired gifts, horse portraits, if you build it they will come, irish art, irish artists, irish gifts, Irish presents, Karen gibney, leonie Sutton, memento keepsake jewellery, Nadina Ironia, shopping, special edition browbands. Bookmark the permalink. Leave a comment.